It was a warm night. 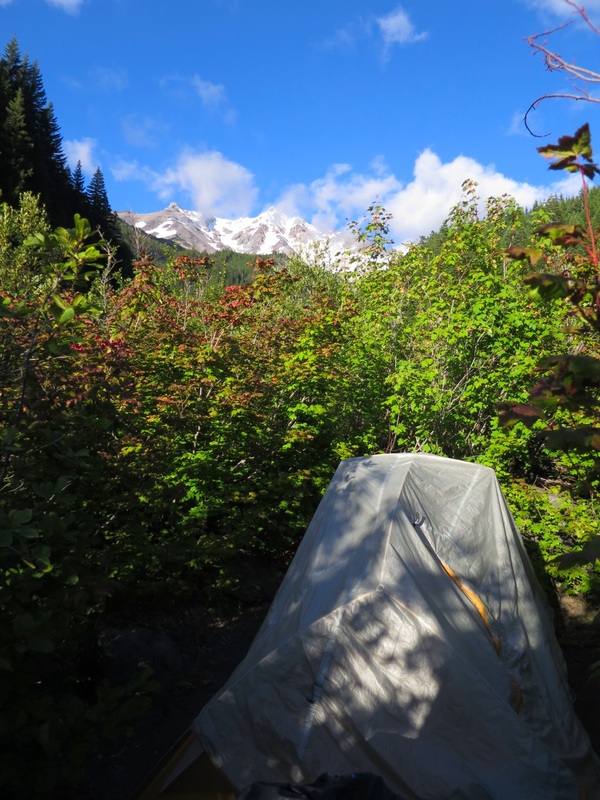 We slept without the fly and at one point Andy woke up to the moonlight casting shadows of leaves across the tent. Our alarm went off at 5:10, neither of us wanting to open our eyes but we knew we needed to get moving. We stopped earlier than planned last night and wanted to make up those miles today. We snuggled for 5 minutes and then started the packing process. We were on the trail by 6:15am. Very reasonable for us. 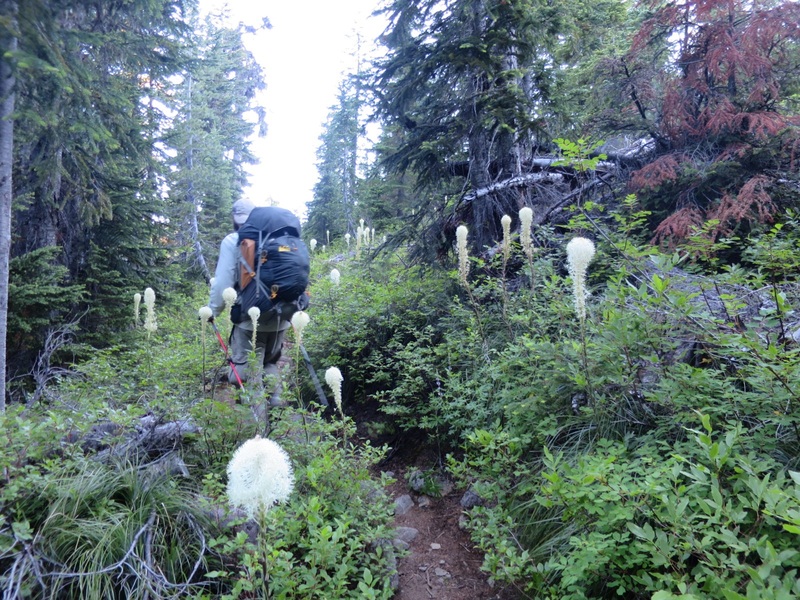 We initially climbed for about 2 miles, walking past lots of blooming bear grass. Our bodies felt good and our lungs happy in the fresh morning air. Climbs always feel best first thing in the morning. At the top of the hill we dropped down past a small pond where another couple were packing up their things. We recognized them from a few days prior at Big Lake Youth Camp. 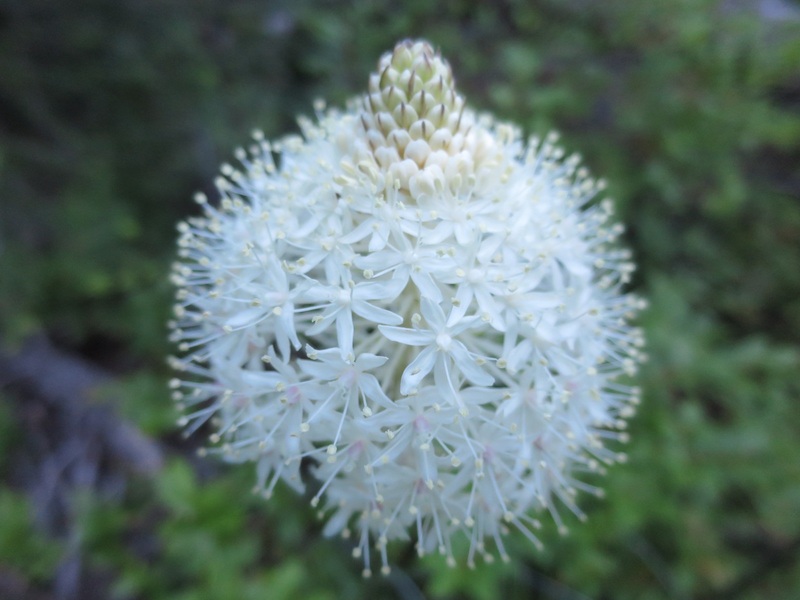 It is nice seeing familiar faces along the trail – it contributes to a nice sense of community. We got to Russel Creek and investigated our options. 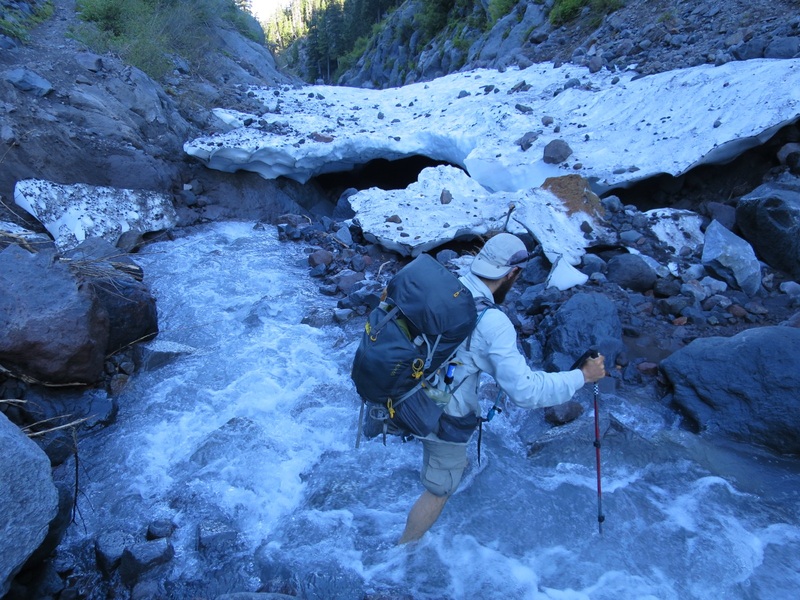 We could either walk across a quickly melting snow bridge or ford the icy cold river. We choose the latter. 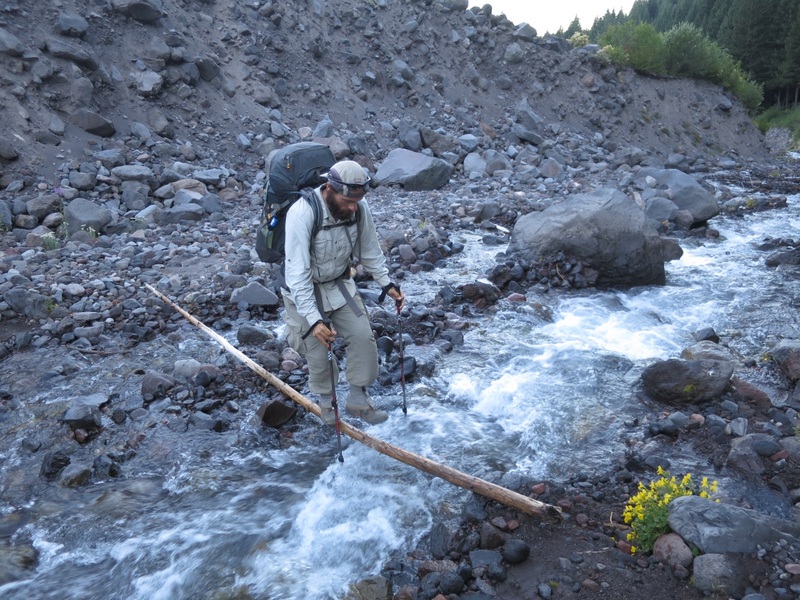 It was painfully cold and difficult to see where to put our feet through the cloudy water but the creek was narrow and so much tamer than what we had experienced in the Sierra. We were relieved and felt good knowing our creek crossing confidence had been restored. We climbed up some more to a green paradise. Bright pink and red paintbrush littered the ground. We walked past ponds and lakes and through vivacious green meadows. 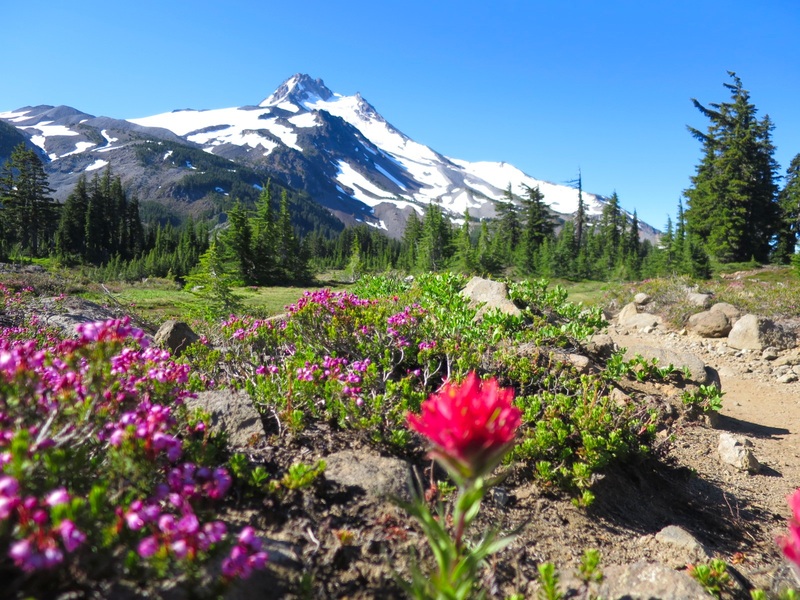 Mt Jefferson stood tall in the backdrop. It was truly a spectacular area. 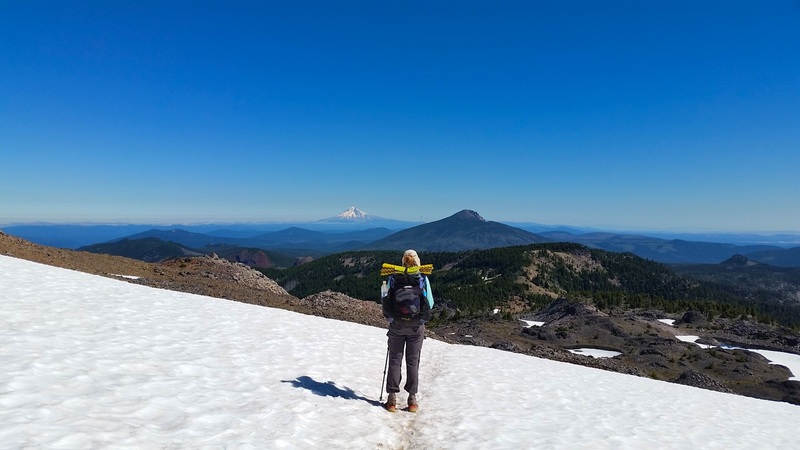 We ascended another 800 ft to a ridge with views of Mt Jefferson to the south and Mt Hood in the north. Simply incredible scenery! We took a short break amongst a rock pile and were swarmed by mosquitoes. The views were worth the pestering so we stuck it out. Once on the north side of the ridge we stepped and glisadded down a few large snow patches. 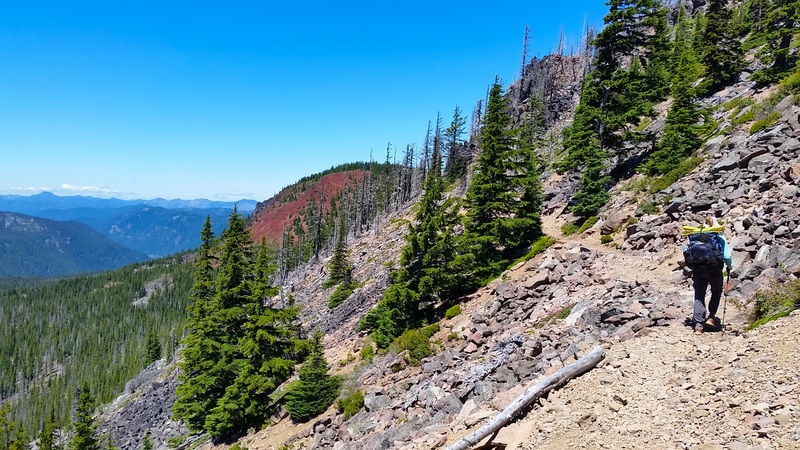 We passed many backpackers and day hikers out to enjoy the area on this beautiful Saturday. The longer we are out here the more we notice the clean smells of day hikers. We ate a late lunch at Upper Lake before continuing down the trail towards Ollalie lake. We walked past other wooded lakes and wandered deep into the forest. The trail was flat but rocky. 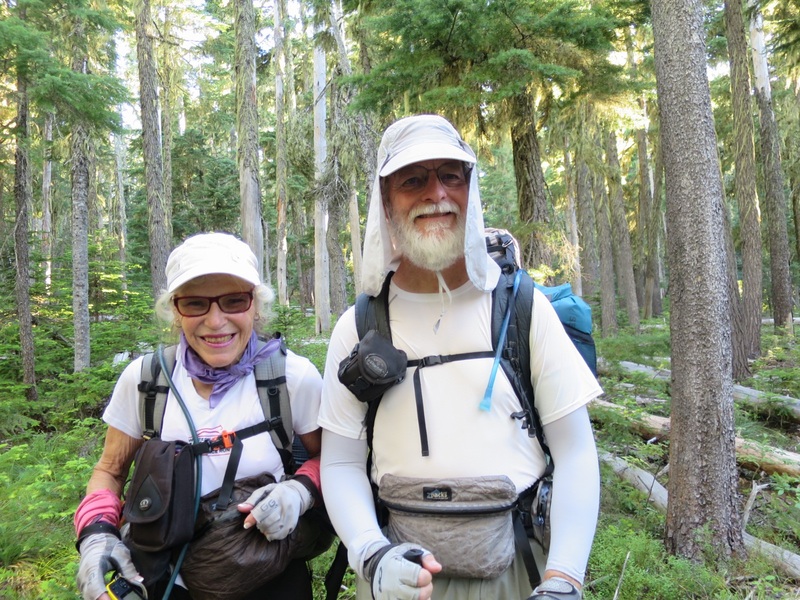 Around Jude Lake we ran into a couple in their late 60’s named Instigator and Expediter. They met in a backpacking club in college and have been exploring and hiking together ever since. They were such an inspiration to us. 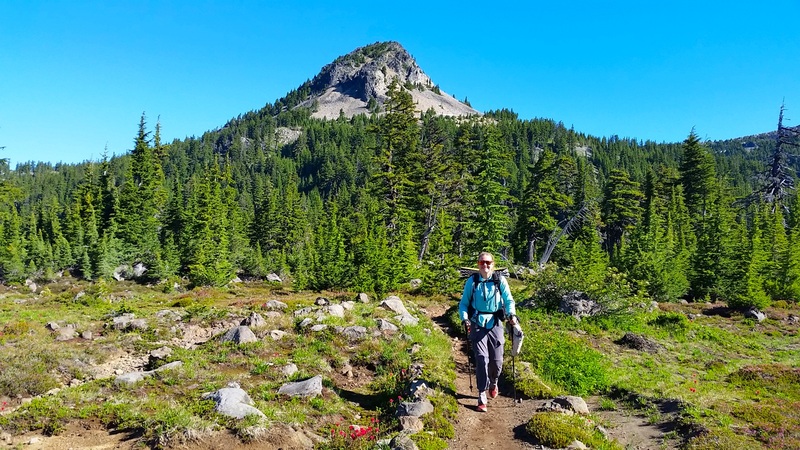 We hope to still be doing thru hikes in our 60s! At 6:20 we decided to shoot for 30 miles. We still had gas in our tanks and wanted to push ourselves. Could our bodies handle it? Was it just our egos egging us on? We figured we would find out. We passed our originally planned campsite around 7:00pm. There were literally 8 tents tucked in together amongst the down trees. We were glad we had made the decision to keep walking since we may not have been able to squeeze in there. 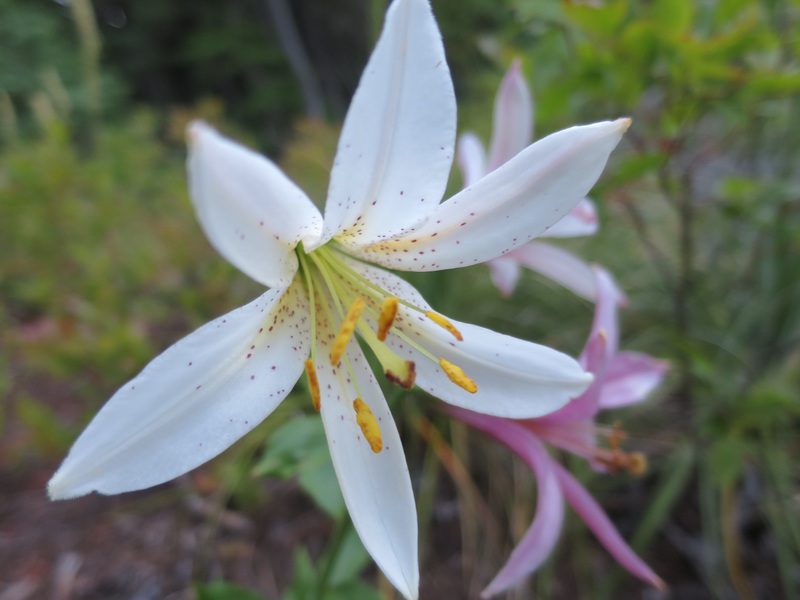 The trail was initially flat but then climbed around 800 feet past fireweed and mountain lilies and back into the trees. Once on the ridge we started looking for a spot to call home. The first spot was taken. The second spot had toliet paper everywhere and a shirt crumpled by a tree. It gave us both the heeby jeebies. 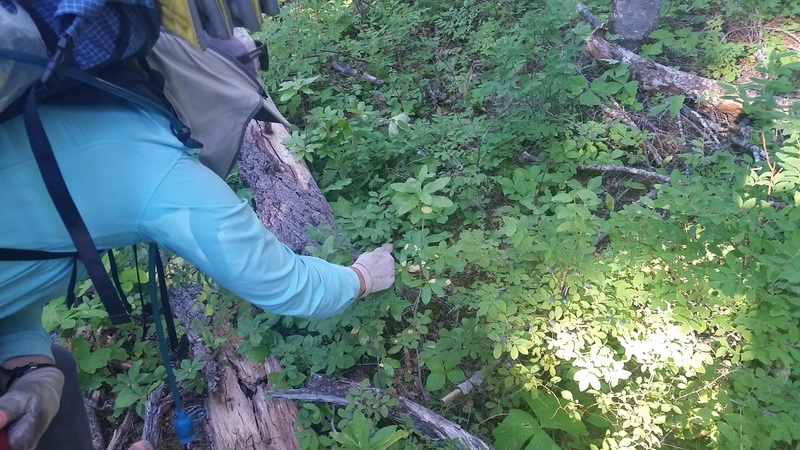 We agreed to walk a tenth of a mile to another spot identified on Guthook (one of the apps we use for water sources and tentsites) but we never found it. We ended up walking three tenths of a mile tired and hungry looking for camp. Eventually we found a flat spot and called it home. It was 8:45pm. Laurie crawled inside while Andy cooked. Laurie was very happy with celebratory hot chocolate while sitting in her sleeping bag. By the time we ate and cleaned up it was past 10pm. It is hard getting into camp this late but we are so glad we pushed ourselves a little. We just hope our bodies agree in the am! Tonight we are grateful for our tough feet and tranquil forests. Mt. Hood here we come! I discovered you two a few weeks back…and im hooked on the writing and photos…Yesterday I stopped by REI for the first time….I see a pack in my future…slow down I dont want this to end…lol. Thank you so much. Andy said just this morning that if one person goes hiking because of us, we have done our job. You may be our one!!! Rei is awesome and kinda addicting 😉 happy shopping!! It’s incredible what our bodies become capable of.